Wow. I’ve never been smelly but recent events had me sniff-checking everything. It’s no secret the Tahoe is a wreck. I’m OCD but have to combat that with being a complete slob. If I keep it clean then I HAVE to keep it clean. So I let it be a complete mess. That all may have to change. I did a prelim clean the other day throwing away the big chunks and putting the rest in piles. There’s the front seat, back floorboard and cargo area. I’m feeling pretty good about myself – Rome wasn’t built in a day right? Right about the time Silk was looking for his vest I noticed a little funk. Could it be the socks, shoes or helmet from Sunday? How about the krispy kreme box from Friday? Or maybe the near empty chocolate milk containers? Milk can get get funky. Forget it – let’s wait a day or two and see (or smell) what happens. Unfortunately this morning set off an olfactory alarm of gagging proportions. On par with a triple-gagger diaper changing. Wife and kids were waving goodbye as I opened the car door so I had to choke down some puke, pull out of the driveway and roll down the windows as I left neighborhood. Gasping for air I cussed it aggravation. Aggravated because I’m frustrated with how nasty I am. Aggravated because something is in the Tahoe and I’ve got to find it. So I put the sniffer to work. Ran through the usual suspects. Mild funk but nothing a stick-up couldn’t handle. Check under the front seats. Check the cargo area. Nothing. On to the back seats. Driver side – nothing. Passenger side door opens – dry heave. Damn, that’s where the Publix pork roast went. I was all pissed at the bag boy for shorting me and it was MY fault. I had clearly shoved the shopping bag under the back seat when loading my groceries because there was nowhere else to put it. More cussing because I now know I am a piece of crap. So happy Friday to me. I am now committed to re-inventing myself, again. I’ll embrace the OCD and clean it up. Washing and checking here I come. I’ll try to snap some pictures of the Tahoe detox. Got in some miles this weekend. I met up with the crew both days for some fun riding. I jumped in on both rides, so I didn’t get as many miles as they did. I guess I probably got in around 50 miles between the two days, based on them claiming 65 miles. I rode the Lynskey both days and had a blast with it. It needs some work now (more on that later) so it may sit on a hook for awhile until I get a chance to get to it. Saturday had us riding east. Its been awhile since I have been on a group ride, so it was a surprise to see how mean everyone was to each other. They have either gotten more t0-the-bone with their insults, or I have gotten weak. We headed out with a pretty steady pace to do TB, Cadillac, the bucket loop and a whole lot of grass field riding. Tyler stepped up and took charge of leading the ride; which was awesome. However, we logged in a fair amount of miles on what felt like riding on a wet mattress; uphill; with a headwind; brakes dragging, etc etc. On the way back, we really lifted the pace for awhile on upper Cadillac. That was fun to see how the 29er felt at speed. When we got to Piney Z park, we found a camelbak that appeared to have fallen off of someones trunk as it was just sitting in the parking lot unattended. We went to take a look to see if we could find some identifying objects and we stumbled upon a newish looking Blackberry. Great! Now we definitely have the obligation of trying to find the rightful owner. I texted the two most recent contacts in her message list. She (the Blackberry owner) had been staying in close contact with “Kate” and “Nathan” since midnight and had been recently texting Kate. I let them know that we found the phone but we never heard back from them. While we were waiting on a return text, Juancho and the Big Ring Circus showed up for a couple jokes. They hurried along as they HATE to be seen on the trail with, or even near, us. I think its just bad for their rep. Before we left, Chris made the executive decision to call “mommie” and let her know that we had found her daughters bag and phone and that we were leaving it at the bathroom at PZ park. The gang had mixed emotions about that being a good idea, but we let it slide. Sure would like to know how that all panned out. Anyway, we road on, shared a few more words with the BRC and started to go our separate ways. I heard it was another TT back to Joes. Sunday was north. I met the boys on the powerline and we headed out for some Red Bug, Phipps, Secret ST, Overstreet. We had the dragon with us this time and we were relentless on dragging him around for his Felasco prep. There were a couple of “sprints” on the otherwise tame ride. Some new routes were laid out by BW. On the way back from the lake, through a particularly technical section of flat dirt road, I grabbed Chris’ handlebar just in time for him to tackle me. Seriously, we went down faster than you could say “big man falling”. Not even close to the first time I have crashed with Chris, and probably not the last. We got back rolling quickly after some laughs of some of the witnesses and headed for Secret ST, Everything seemed fine, but I noticed later that my front rotor was very warped. (I did have to straighten my bars and brake levers after the crash) After getting home I realized my brakes were really dragging and it was hard to push the bike. Its possible that the rear wheel slipped in the dropouts. I haven’t had a chance to look at it yet though. I know I have to work on the fork too, so it may sit idle for awhile. I summary, I got 50 miles in this weekend, which makes a total of about 60 for the past six weeks. I had a blast riding with the gang and am super motivated to get back out again. Now I see that all the breeders are full of it. I was always curious if it really was true. The breeders will tell you that having a baby is a must-do and you will never be able to find as much joy as a baby. Maybe. Maybe not. I think that what is more likely is that they want to see you go down in a huge ball of flames. That will bring them joy. Unfortunately for me, most of my crew already has kids and I have zero victims-to-be on the back burner. Luckily, I have brought joy into my friends lives by wallering in the grips of misery for the past six weeks; but they are are liars and I hate them all for the truths they have sheltered. A quick run down of some of the crew will show that I don’t have anyone to bring me joy in the way others have had with me. I don’t have anyone to point and laugh at (except for Darien, but thats too close to my own misery. that will most likely be a simultaneous laugh and cry). Some of the guys are too young, some are too old, and only two are possible candidates. So, be sure not to let Steve or Tyler in on any knowledge of any of the misery of fatherhood. In the meantime I will have to decide whether to take the high road, or be deceitful / unscrupulous / unconscionable and join the ranks of the lying majority. As far as bikes go, here we go. I have my wheels finally and the Lynskey is getting built today. I plan to meet the guys for Thursday lunch. I plan to watch a one time showing of a cycling “movie” tonight with the chain gang. So, yeh, I am on a come back and actually plan to get on a bicycle one day real soon. Author adminPosted on October 22, 2009 Categories UncategorizedLeave a comment on Now I get it! Way to go Bike Chain! From the racers to the cheerleading section, the chain gang was in full effect this weekend. It definitely makes the racing much more fun to have the whole family out there in attendance. Gotta give all the racers due credit; each rider brought something to the table. Tim, jeeeesh, what a breakthrough performance. Expert podium, not much more to say, that was awesome. Ric, prolly not what he would have liked under normal circumstances. However, to have been sick (in the lungs too), make a game day decision to race, and not have been run off from the soflo bullies – that was very impressive to pull off a 3rd place with mad consistent lap times. Its crazy to think that 3rd place in expert is a dissappointing finish for you. Zak finished a race!!! And got 3rd place in expert lite (singlespeed). He looked solid on the first two laps, leading some of it, until a couple crashes and a wall got in his way. Way to gut it out to 3rd. David won in sport class and made it look easy with expert lap times (very consistent too). Tyler did his first race, and won!! On a fully rigid bike by the way. Terry trained so much in the past three weeks that he caught and passed Steve (who beat him at the last race). Maybe Terry gets the most improved medal?? And then Steve, who showed up at like 10 or 10:30 wasn’t even going to race. He finally got talked in to racing (luckily, he just so happened to have his bike and all necessary race gear :)) and raced with style – enjoying a quesadilla from Tijuana Flats while coming through for his last lap. I’m not sure how Colter and Jason did, but I know Colter was never going to race again at his last race; but he did. And jason seemed to be pretty happy with his race and more happy that it was over…. You guys be sure to go by Tijuana Flats and let them know how good the food was and that we all appreciate their support. Well, FSC #3 at our local trail is coming up this weekend and I won’t be racing. For those of you who have raised children before will understand and my excuse can be shortened to just a few words (I have a 5 week old girl). For those of who have never had the pleasure, I don’t think you will ever understand the level of pain until you do get the chance to care for a newborn baby. It is not as simple as saying that you get robbed of sleep. It is day in and day out of pure sleep deprived misery. You get to sleep at intervals of 1-2hours at a time with 1-2 hours awake time between. If you are like Darien, no problem, you just go back to sleep. If you are like me, that basically means you don’t ever get back to sleep after your first 1-2 hour “nap”. Have you ever had a couple of bad nights of sleep in a row?? Yeh, try 40 days in a row so far. So, to say I feel like crap is an understatement. I tried to do round #2 and realized that was a mistake. And, that was three weeks ago, I am way worse off now. In the past 5 weeks, I should have gotten in around 50 hours of riding with structure, to include approximately 30 rides, 10 runs, 20 days in the gym. Hmmm, not quite. I’ve gotten in three bike rides to total about 2.5 hours, 2 runs that equal about a mile if added together, and 100 pushups (50 on two different days). So anyway, I am not racing. Not because I have a problem not winning, but because my body and my schedule will not allow for recovery if I were to attempt to race. But enough about me. It is beginning to sound like everyone is backing out?? We drive out of town all the time to race and now we can’t even race out of our own back door? Ric, sick. Jim, sick. Ken, Sick. Terry, not sure but he seems down that everyone else is backing out. Tyler is doing first timer and going full rigid to give his competitors a fighting chance. Chris? He was motivated to help provide on-trail protection for Ric in case those clowns tried to jump him. David will race, but he will be all decked out in his endurancefactor gear. Steve and Tim???? Darien, you better race now while you can. Zak HAS to race cause he has a new bike to show off. Kent. ( I figure that was enough said about that). Anyone else gonna race? Come on we gotta represent. It all about flying your colors. What gang are you with? A man’s got to know his limitations! A good size group of Bikechain’s posse made the trip to Fernandina Beach this past weekend for the second installment of the Florida State Championship MTB Series. Me, Big Worm, Wrecking Ball and Spanish Mackerel loaded up the truck on Saturday and headed over. Derwood with his liter, Red Dragon with the Ball and Chain, and Iceberg with his parental/sibling units also made the drive over Saturday. Marko and Silk got up before the chickens on Sunday morning and headed over in time to make the race. Saturday’s pre-ride was uneventful. This course is fun to ride. Nothing real technical, but fast and flowy. You can lose your head on this course if you’re not careful (literally). There are quite a few low hanging limbs waiting to take your head off if you are not paying attention. Not a big deal on pre-ride but be careful on race day when oxygen deficit is maxed out. Load the truck back up, head to the hotel, get cleaned up then go find grub. Hmmm, ate at a really good Italian restaurant there last year so we hit it again. Good food, good times. Argue about what each of us owe, stress about it a little more until Big Worm starts to explode then head back to the hotel for some R&R. Watch a little Police Women of Broward County to look for lil Ronnie (Big Worm says he wears skirts and rides like a girl so he might be featured on the show). Get ready for sleep before a tap on the door. Bikechain’s CEO decides to make a late night sales call pimping the new Bike Chain gear. Swag and monies exchange hands and finally get rid of CEO. Lights out. Six thirty came early. Big Worm did his usual jump right out of bed, head for the door and hit breakfast. The big man worries that he will not get his 5 waffles if he is not first to breakfast. Terry is on the big man’s heels. Me and Mackerel take a while to get motivated enough to get up. I am in my typical race day panic mode questioning why in the hell I put myself through the stress and aggravation that comes with racing. I can’t bring myself to eat much on race day due to nerves, but manage to swallow a bagel and banana. Off we go. Yellow wave goes first. I’m in my second ever Sport race and about to soil myself on the starting line. Horrible start. I KNOW everyone is faster than me so I go into the woods near dead last. Crashed 2.5 times in the first lap. Needless to say, this is not going well. Get behind a few guys not going very fast and just sit there knowing I should get around. About get head taken off while trying to let Mr. Amazing Pro Dude (Bob) around. Three laps and cross the finish line in 20th place (out of 27 riders). Did I give it all I had NO, was I disappointed YES. If I can’t get these pre-race panic attacks in order then my racing days may be numbered. I’m pretty good at handing out water bottles. Maybe there’s a place for me as the MTB version of a domestique. Congrats to Iceberg (1st); Big Worm (3rd) and Silk (4th) on their podium finishes. Great job to the Red Dragon and Bikechain for being the round sponsor . Tom Brown in two weeks. Trying to get my wife to get us out of town that weekend but no luck as of yet. Damn I may have to enter ANOTHER race. 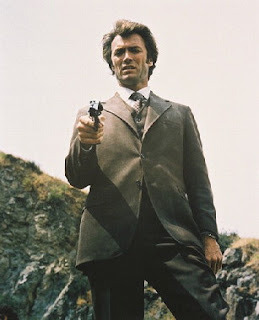 Do I feel lucky, well do I, punk. Author BIG JIMPosted on October 1, 2009 Categories UncategorizedLeave a comment on A man’s got to know his limitations!